The Advantest R3261AN spectrum analyzer is a wide band, very sensitive receiver. It works on the principle of "super-heterodyne receiver" to convert higher frequencies (normally ranging up to several 10s of GHz) to measurable quantities. The received frequency spectrum is slowly swept through a range of pre-selected frequencies, converting the selected frequency to a measurable DC level (usually logarithmic scale), and displaying the same on the CRT of the Advantest R3261AN. The CRT displays received signal strength (y-axis) against frequency ( x-axis). Some applications for Advantest R3261AN Spectrum Analyzers include Site Monitoring: Verify that the frequency and signal strength of your transmitter is accurate. Interference: Before a system is installed you use a Advantest R3261AN spectrum analyzer to verify that the frequencies (you plan to use) are not occupied or if the presence of a very strong signal will interfere with your new setup. Interference can be created by a number of different situations. 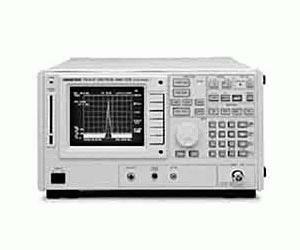 Other tests that utilize the Advantest R3261AN spectrum analyzer features include antenna isolation, co-channel interference, adjacent channel power, occupied bandwidth, intermodulation, microwave or satellite antenna alignment, and characterization of components.